Wedding Shapes: Flower Bouquet, Bow, Wedding Cake, Dove, Ring, Cross, Tuxedo, Heart, Bell, Shoe, Dress & Champagne Flute. 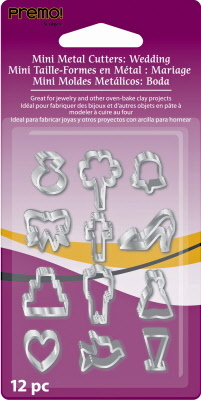 Set of 12 mini metal cutters for use with polymer clays. Size: 12 to 22mm diameter.